Mike's Best Blog Ever: You were absolutely Fantastic... and... So Was I. You were absolutely Fantastic... and... So Was I. A few words on the subject of 'Doctor Who' 2005 to present (or NuWho as I pretentiously refer to it). Zowie!... I just... wow... it's... pluvarb... there's stuff... and it's awesome! Mostly I just mean borrow it from somebody and watch it, or shell out yourself and catch up on TV or DVD. It is better than you imagine, and if it isn't you should be writing your own sci-fi comedy adventure for the whole family that wins awards for being THE BEST year after year. Credit deservedly goes to head writer and show-runner Russell T. Davies, and to the BBC for throwing lots of pounds at everyone they saw. Full in the face. Murray Gold- write us some music (smashing sound of pounds sterling striking Murray Gold right in the kisser). Effects goblins- ditto for you guys (smash, tinkle tinkle). Billie Piper- ah, yes, well, we'll need your face later. Do you take cheques? Making the 9th doctor everything he was to me and you was Russell, yes, and also somewhat the chap with the ears doing all the yammering. Christopher Eccleston (born 1964) wanted to play football for Manchester United when he grew up, and instead he's a brilliant actor. So, win. He's got the range to play the son of god or Destro from G.I. Joe and the last thing he needs to worry about is typecasting. What the Ninth Doctor brought to the table was something apparently nobody thought of before. What if the Doctor was COOL? He's got a working class accent and a leather jacket, he never holds still and he's a thousand times more likely to be seen 'down the pub' than, say, the 6th Doctor. Granted, this series made every effort to stand on its own with zero direct classic series crossovers (yes, the new TARDIS, the new Daleks, but if necessary this series could have called itself a total reboot if that would have made people happy). In this case, I'm glad they later admitted it was still the same old thing, still going strong. Nine is fine. He ticks every box- loved by kids, girls, guys, and oldies. He's very into his companion, loves Rose obviously. But he's even more universally cosmopolitan of taste: he's not specifically just straight or gay: very early on he's flirting with humanoid trees. He really is all things to all people: simultaneously a part and apart from humanity. The sight of him in a council flat living room watching TV seems bonkers because he's so easy to believe as an alien. The Doctor's a war veteran now, the last of the Time Lords thanks to the Time War that burned the heavens. And he's taking those first painful steps toward finding a new world to call his own. I enjoy that Eccleston is an atheist playing a very messianic figure. A healer and a saviour of worlds, a time-traveling demi-god with PTSD. Nine is fun. Cutting a rug during the London Blitz, defending the value of his sonic screwdriver on those long nights when you've got a lot of shelves to put up, grinning and urging Rose (and us) to 'Run for your life!' It may have been a short life, but there were no moments wasted. 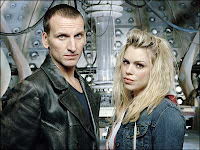 FAVORITE NINTH DOCTOR STORY: 'The End of the World' The first proper time-traveling adventure of NuWho, with effects and aliens and all. Six seconds with the Moxx of Balhoun and the Face of Bo (outshining hours of Alpha Centauri's dithering), a space station where the use of weapons or religion were outlawed, and the fate of the planet balanced against eating chips. LEAST FAVORITE NINTH DOCTOR STORY: I DON'T HAVE ONE. Among other things, his run was too short for clunkers. The other things being: THERE SIMPLY AREN'T ANY CLUNKERS. Series one (or series 28 if you prefer) is, as advertised, FANTASTIC. 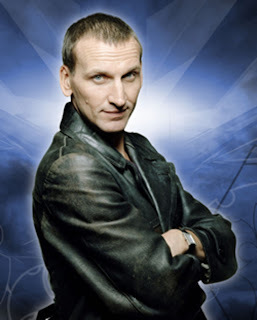 FAVORITE NINTH DOCTOR QUOTE: "You lot- you spend all your time thinking about dying. Like you're gonna get killed by eggs or beef or global warming or asteroids. But you never take time to imagine the impossible- that maybe you survive." That's OK, We're All Stories in the End. I Just Do The Best I Can. Anybody Remotely Interesting is Mad in Some Way. I Shall Beat it into Submission... With My Charm. An apple a day keeps the... ah. Never Mind. The Name is Smith... John Smith. Life Depends on Change, and Renewal.